A PDF file, or Portable Document Format file, is a common file format for documents. They can be downloaded and viewed on a PC, Mac, or Linux computer. PDF files are also versatile, allowing web browsers to display them within the browser window, without downloading the file or opening an application. The Firefox web browser utilizes an Adobe Reader plugin to display PDF files within the browser window. 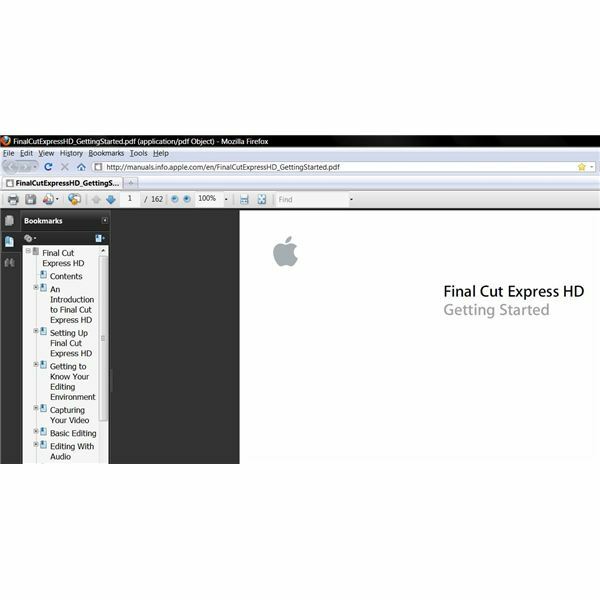 During your normal browsing routine, if you come across a link that connects you to a PDF file, such as the online manual for the video editing software Final Cut Express HD, simply click on the link to open the file. The address of the PDF file should appear in the address bar of Firefox and a loading bar should appear in the middle of the screen. Since the file contains a lot of information, it will take a few seconds for the entire manual to be accessible from the web browser. During this process, web pages that are opened in separate tabs may lag or pause. After the file has completely loaded, you should see the first page of the file in the center of the screen. In this example, it is the title page of the manual for Final Cut Express HD. The total number of pages in the file is displayed in the bar above it as a fraction (1 / 162). To the left of the first page, there is a list of chapters that appear in the manual. After viewing the broader structure of the Adobe Reader interface, you can delve a bit deeper to navigate through the contents of the PDF file. There are a few options for scrolling through the PDF file. The traditional scroll bar on the right side of the page is probably best for moving the viewable area within a single page and for moving from one page to the next. If you want to quickly jump from page to page, instead of scrolling, use the up and down arrows next to the page number display. As you jump from page to page, the page counter will display the current page. If you know the precise page in the file that contains a specific bit of information, simply type that page number into the box containing the current page number and press Enter. The reader will navigate to that page instantly. Another way to navigate through the content is by using the options on the left side of the screen. There are three. The most useful one is the bookmarks. The bookmarks display all the chapters within the PDF file, as well as the individual topics that are covered in each chapter. Drill down into each chapter by clicking the '+' icon next to it. This will display the topics and subtopics. Simply click on the chapter, topic or subtopic of interest and the reader will display that section. The second option is a search feature. Type in a phrase and the reader will search the file for it. The results are displayed and the first result is displayed to the right. A search can also be done from the 'find' box located in the menu bar of the reader. Type in the word and press enter. If there is more than one result, two search buttons appear that let you find the next appearance of the word in the file. The final option for navigating is through the pages bar, which displays each page in the file as a thumbnail. Click on the thumbnail to display the page. Open the Tools menu and click Options. In the Options window, open Applications. Locate Adobe Acrobat Document in the list under Content Type and click on it once. In the Actions column, click the drop-down arrow and select Use Adobe Acrobat (in Firefox). Open the Adobe Reader program. Select the Edit menu and click Preferences. In the Preferences window, go to the Categories section and click Internet. The check box for Display PDF in Browser should be checked. Click OK and Close Adobe Reader. If these two areas are properly set, the Firefox web browser should display PDF files. Image Credit – Screenshot taken by author.